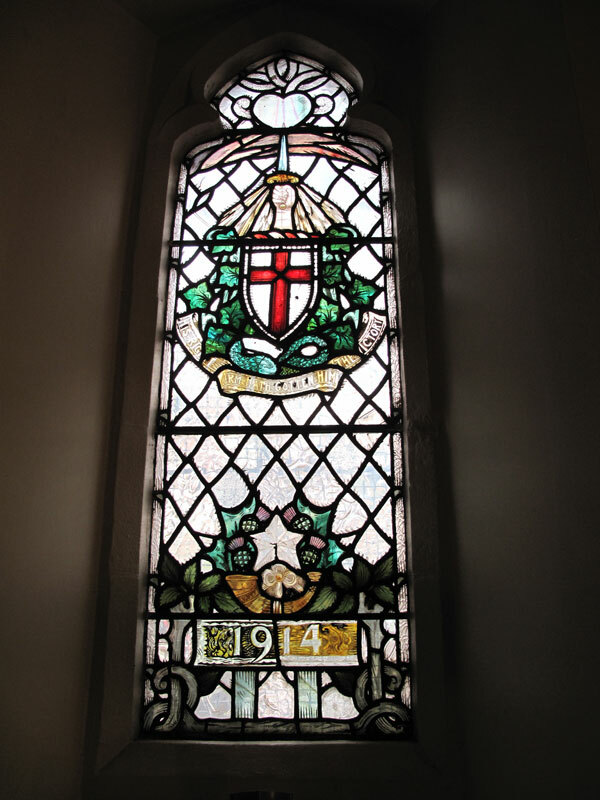 When entering the Church from Merry Street you are immediately met with view of the War Memorials that have been errected. These can be viewed on their designated page. 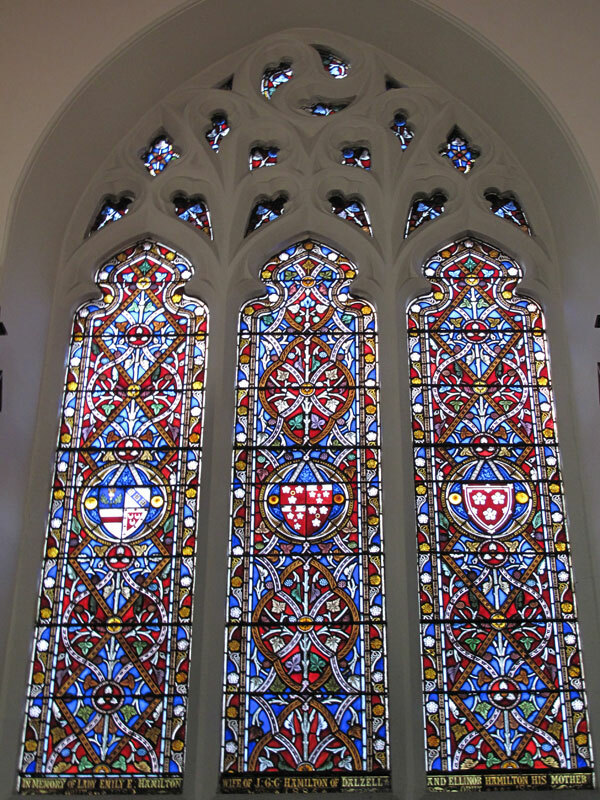 Also in the front vestibule there are two stained glass windows (shown below). Erected 1885 by J.G.C. 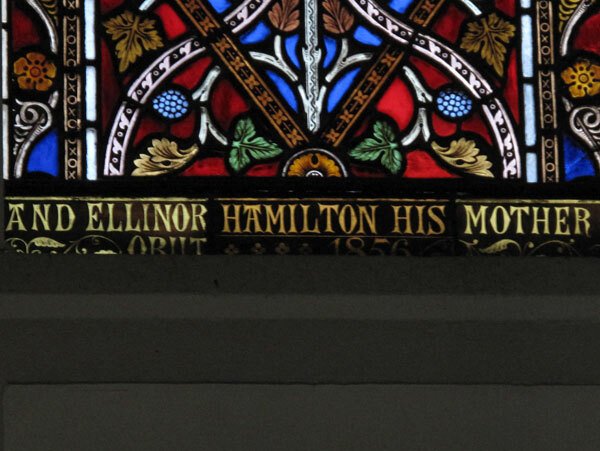 Hamilton of Dalziel as a memorial to his wife and mother. 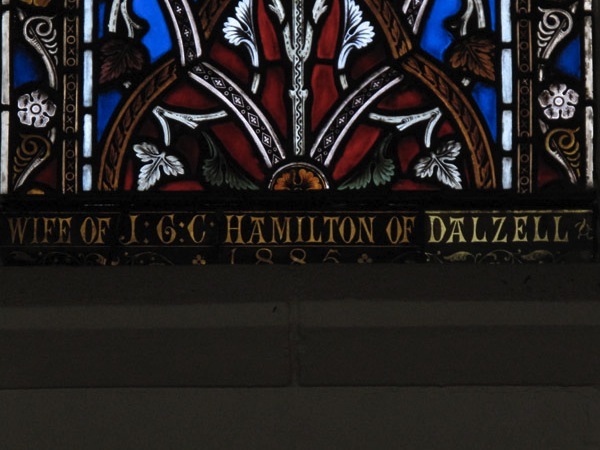 Centre window: J.G.C Hamilton of Dalzell 1885 with his coat of arms combining Hamilton of Dalziel and Archibald Hamilton of Rosehall (John Glencairn Carter 1st Baron Hamilton of Dalziel succeeded father at 4 years old. Long serving MP, created 1st Lord Hamilton in 1886). 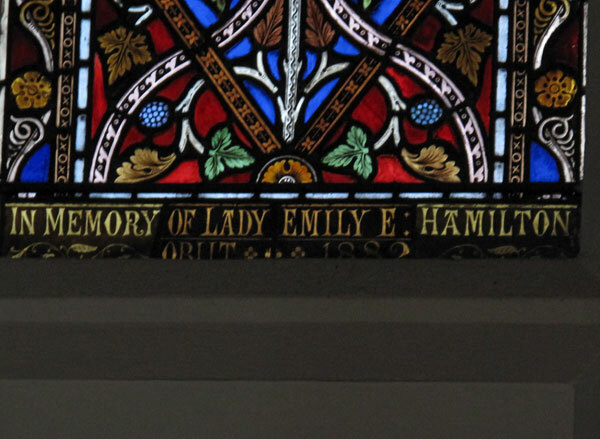 Left window: In memory of Lady Emily F. Hamilton who died 1882. Wife of J.G.C. Hamilton of Dalzell with her coat of arms (daughter of David 8th Earl of Leven & 7th Earl of Melville. She had 8 children). 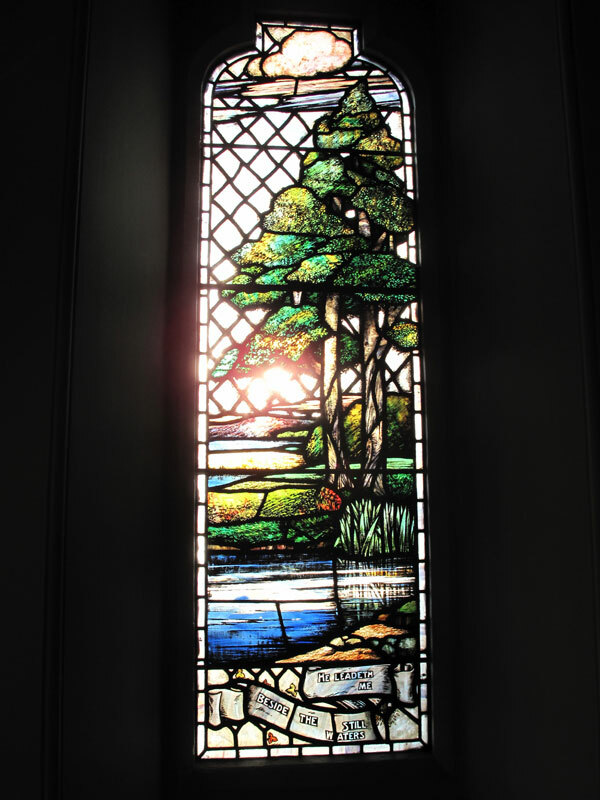 This beautiful and atmospheric window is by the Glasgow stained glass artist Douglas Kenneth Hamilton 1895-1959. It was unveiled and dedicated on 15 April 1956. 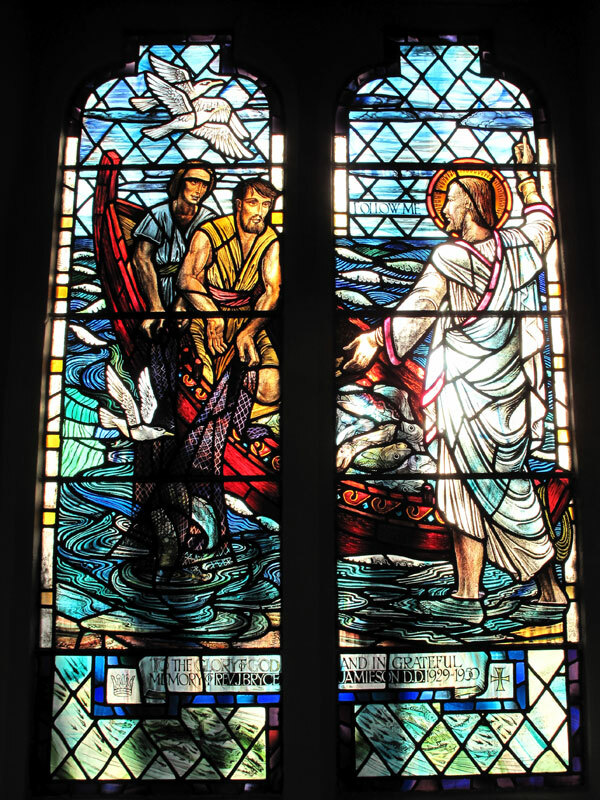 Peter (Simon) and Andrew are pausing in their work and listening to the imposing figure of Jesus say “Come, follow me and I will make you fishers of men.” Mark 1 v 17. The detail of the fish in the boat, nets and water are particularly fine. 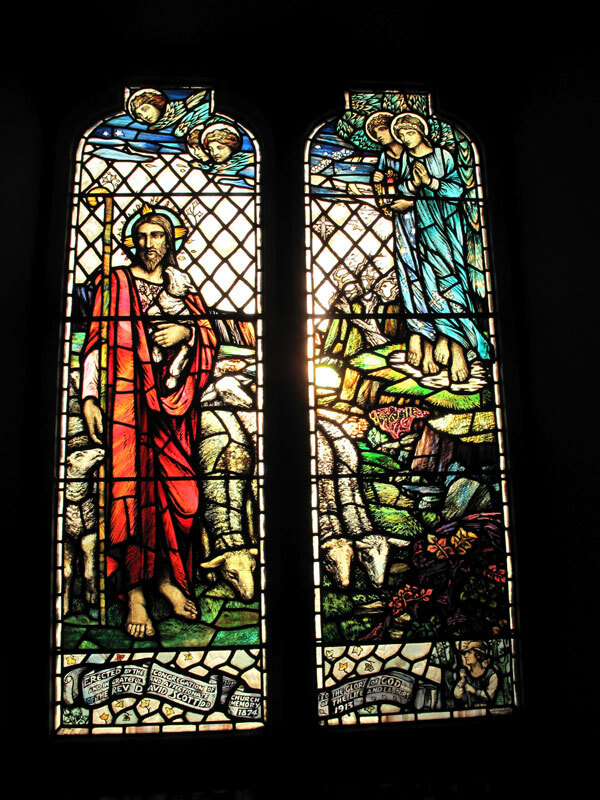 The main theme is the subject of “The Good Shepherd” and this is illustrated in the two centre windows. The imposing figure of Christ, with earnest and sympathetic expression, is leading his flock through a rugged and difficult country strewn with briars and rocks and is sheltering in His arms a little lamb, too weak to tread the rocky path. Canopying above both lights is a group of angels and cherubim figures guarding and lighting the onward path. At the base a small pastoral figure completes the picture. 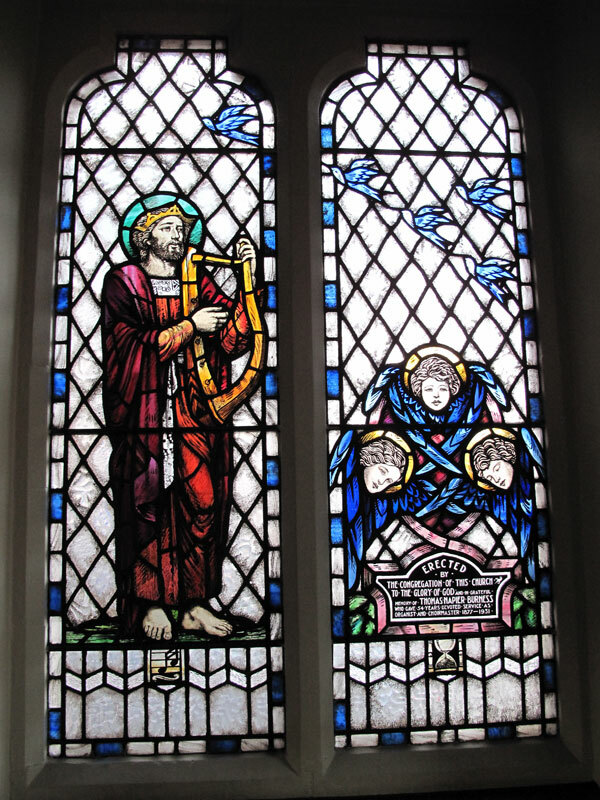 The outer windows on the right and left of the main subject, are taken from the Psalm 23. The dark, difficult and dangerous path, strewn with boulders, winds through forbidding, rocky cliffs, towards a glorious and mysterious light, which gilds the cliff tops. The guiding star shines in a serene sky. In this light the prevailing feeling is one of calmness and sunlight. The “green pastures” and shady trees reflected in the pools of still waters indicate the consummation of the pilgrims progress, a land of peace and loveliness. 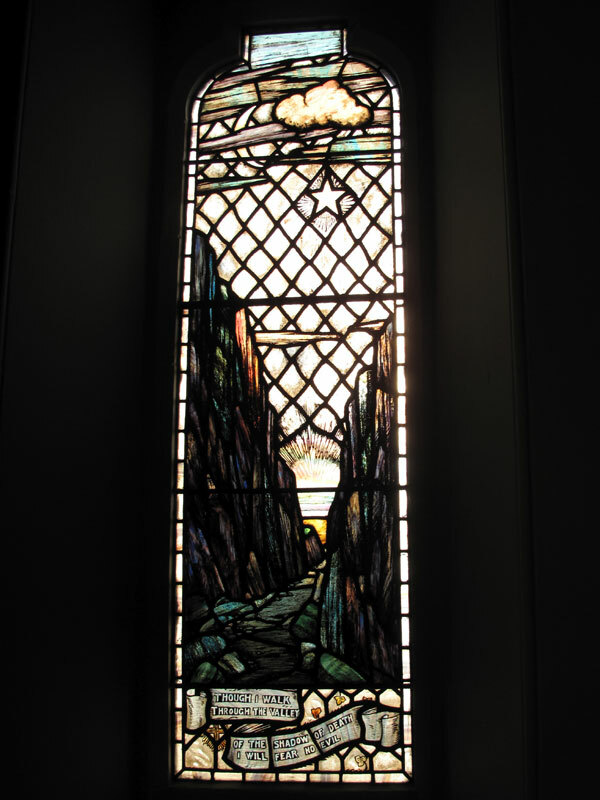 This window is by stained glass artist Isabel Goudie. The general subject is the Christian Virtues indicated in the words “ I was hungered and ye gave me meat,” and subsequent verses. The texts are illustrated by a series of groups in a vein which combines a quiet realism with decorative quality, the colouring being rich and warm with reds, yellows and browns predominating. 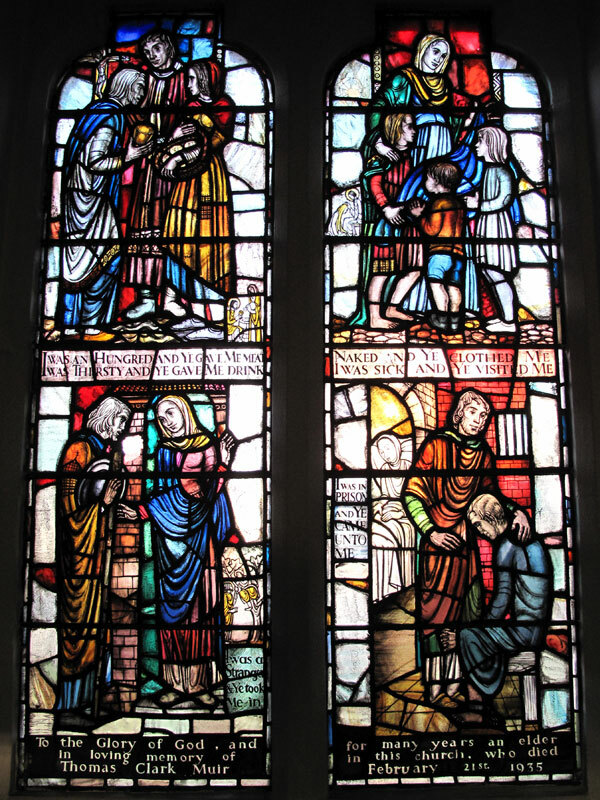 The illustrations include a visitation in prison, a stranger being received – “ I was a stranger and ye took me in”, and a group of children—“naked and ye clothed me.” An engaging feature is a series of small insets further illustrating the text, and carried out generally in line. One of them presents the woman of Samaria at the well, and another the publican Zaccheus, on the tree, in whose house Christ chose to stay overnight. These insets have an engaging liveliness and enrich the general scheme without undue distraction. 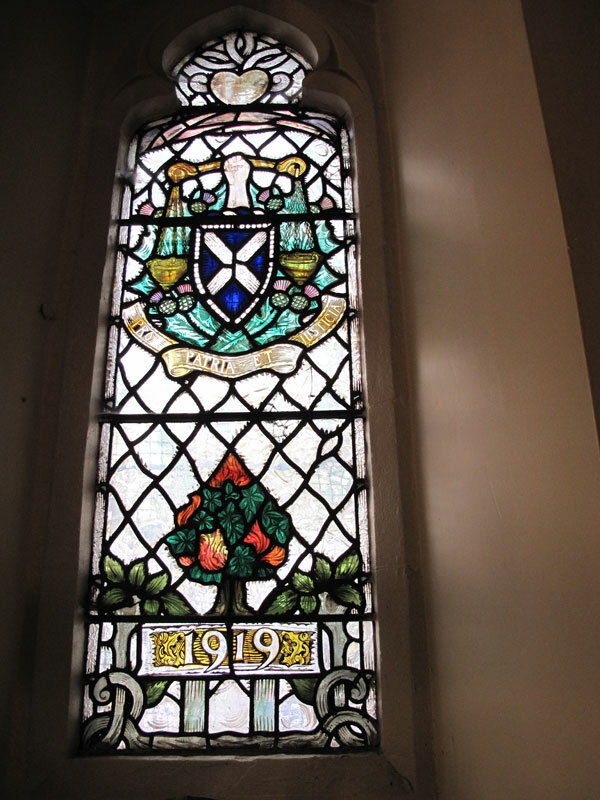 For more information on any of the Stained Glass Windows please get in touch with the Church Office.